If there ever were a “secret” to Search Engine Optimization (SEO), it’s blogging, which can dramatically help a business succeed on the web. It’s a highly competitive sport, which isn’t all that surprising given that 33% of all Internet traffic goes to the #1 result. In response, many small businesses are starting to take blogging seriously, making the field increasingly challenging. To make things more complicated, traditional SEO is only one part of the search marketing business equation: It’s not just about getting found. It’s also about being qualified, then actually converting on a business goal. So how do you beat the competition? By getting your blog in order and integrating it with social media. Beautiful websites with quality content can make for a really snazzy conversion tool, helping you turn prospects into customers. But what of being found to begin with? Blogging helps a business communicate its expertise and Relevance to search engines, so Google has more confidence in suggesting the site to searchers like you and me (by “Relevance” we mean “stuff about what you do”). This is particularly the case if other sites link to the blog content elsewhere on the web. Indeed, Google in large part ranks a website not just by what’s on it, but by its Authority, or the number and quality of links pointing towards it. These are known as “inbound” links, or “backlinks.” As a general rule of thumb, the more the better, though quality usually trumps quantity alone. (For more, see How to Keep Up Your Company Blog and Why). Anyone remember “ludicrous speed” from the movie Spaceballs? Well, that’s sort of what social media can do to your blogging/search efforts. So far in this post we have touched on how blogging enhances Relevance, Authority, and Conversions, together supporting the above-mentioned search marketing equation. When you then integrate your blog with social media, you’re basically putting those efforts into hyperdrive. Here are the big three reasons why. Posting a blog post link on social media creates an inbound link, and one that has garnered Likes and Shares sends a powerful quality signal to search engines that the original content is of real value to actual people. These “socially validated” links to your site help develop Authority, which makes your site more competitive for searches related to what you offer. Newer information, by and large, is oftentimes perceived as more relevant. But what does that have to do with sharing posts on social media? Doing so is extremely important because it sends a signal to search engines about where a “conversation” is — virtually in real time. “Conversation” can be broadly (and perhaps, generously) defined as the latest human understanding about any given topic. That’s often the best kind of search result. So by sharing your blog posts using social media, you are increasing the likelihood that your site will come up for searches related to what you have been writing about on your blog. While not every social media post needs a blog post, site content is definitely worth integrating into social media, particularly when the subject matter is of a strategic nature and is likely to get a lot of Likes, Shares, Comments, RT’s, +1’s, etc (collectively, “activity”). Remember that the social media platform helps shape the message, since the audiences are likely different, and expect content formatted specifically for the respective environment. Facebook is excellent for community engagement, and images do very well. Twitter is great for outreach, since a great link can be Retweeted around the world and back in no time. For it’s part, Pinterest seems to have a lock on women 25-44 years old and making $25-$75k/yr, so know thy audience and test what resonates with them. At a minimum, don’t forget Google+ pages for business. And why NOT kiss the ring of the King? Posting on G+ gets your content rapidly indexed by Google, and your network and Authorship can even affect rankings! If this all seems a bit overwhelming, just remember: In the long term you can win by creating and sharing blog posts that demonstrate a deep understanding of your customers and their needs. 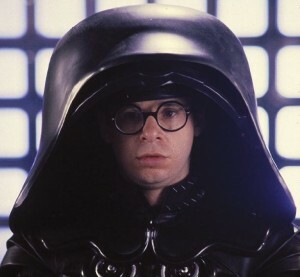 Photo: Still of Rick Moranis in Spaceballs, © Metro-Goldwyn-Mayer Studios Inc.